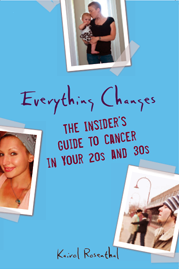 Everything Changes – The Guide to Young Adult Cancer » Are You an Athlete Living with Cancer? great article. i never realized how long term the effects of cancer treatment are, both physically and mentally. i hope you keep on pushing yourself and inspiring others through your words and actions. I am somewhat in the same boat. I was diagnosed with Thyroid cancer, and while my treatments I considered ‘easy’- they still took a toll on my ‘in-shape’ body. I could run for miles with not getting winded, not ache or hurt. But now, my cancer has left me with arthritis in my knees so I am unable to even endure one mile of running. Others would envy my body I was lean and muscled. Without my thyroid, my metabolism is out of wack and I turned into flub. I’m working with a personal trainer, and he knows what I am going through. He listened to me cry when I realized that I would never run again like I used to. He reminded me that I now have good health and I can regain most of my abilities. So I will share with you what I have been told; To keep pushing yourself. You are a survivor. You cheated death. Don’t let cancer take what you once had. Janet, you raise an interesting point. Doctors don’t know how long it will take an individual person to recover. Based on scientific research they know how long it typically takes a group of people to recover from an illness; science usually works in averages. The hard thing is when you are an individual who is an outlier and you break the mold of the typical patient, like Kristen and like myself. For me, it was immensely helpful to find a doctor who specialized in outliers, who had many patients on the fringe. Where other doctors simply lacked knowledge, he was able to tell me what is more typical for an unusual case like mine. Even though I don’t fit into the typical patient mold, I do follow the pattern of many other patients whose cases are more complex. It has been such a relief for me do have a doctor whose knowledge extends to this level. I had to learn to measure myself about where I was coming from post-treatment, not where I was pre-treatment. I’m a cyclist, and for a long time I was constantly frustrated when my performance did not compare to my “before” days. I would get depressed after struggling on rides with partners I felt I should have competed better against. It’s a long road to get back the strenth that was there before, and I had to re-learn to push my body into the uncomfortable zones in which you have to operate as an endurance athelte. Now, almost two years out of treatment, I FINALLY feel like I’m approaching where I was before, but I’m still not there and there are still some obvious deficiencies. Lots of patience is required. We don’t just have to build back endurance. We have rebuild lost muscle, which is even more difficult for the 40+ crowd. I had the opportunity to coach this young woman for a bit in college and am inspired by her story as any reader of this article should be. Toughness, drive, ambition and self-motivation are a huge part of her make-up. So when Kristen says her energy was zapped – believe it! Realize that these athletes face a huge challenge – carrying a heavy class load along with balancing an arduous Division – 1 training schedule. As coaches (who are more often than not, former student-athletes themselves) we teach and preach the importance of mental and physical toughness. Most athletes must possess these qualities if they are to succeed on the playing fields. As Kristen continues to battle this awful disease, she will no doubt call upon those same qualities to get her through whatever comes her way. Keep battling! Chris, you said it was “almost two years out of treatment, I FINALLY feel like I’m approaching where I was before”. Thank you for sharing that it takes time. I know if I had spoken with others while I was recovering, I would have felt better and less alone about the sometimes long and slow process of getting back to what we would each consider our own “normal”. Keep pushing yourself, you will always be an athlete. Lauren, congratulations for continually pushing yourself, and continually fighting what cancer did to your body. I love your words “Don’t let cancer take what you once had”. It has been important to me to take back what cancer took away, even if, like you, I may not be the same, but I am feeling like myself again at least. I hope you take care of yourself as well. Amy and Janet, thank you both for your kind words. I am so happy to be able to share my story and my experiences. Kairol, thank you for making it known that there are doctors out there that deal more specifically with the outliers. It is so important that patients know everyone deals with things differently and that there are doctors who may be a better fit if that is an individual’s case. This is one of my biggest worries right now. Granted, I am in the middle of chemotherapy, and I can also say they’ve been relatively “easy,” but I was an avid hiker before all of this, and now I can barely catch my breath walking around my neighborhood. I also have trouble running because the scars from my biopsy aren’t fully healed. I know it will take time to get back to walking/running/hiking shape, but have you found that you’ve been able to work towards getting to the place you were before cancer? Emily, thank you for reading and responding to my post. I think the most important thing to realize that healing and recovering takes time, and can be different for everyone. I experienced complications with my breathing when I was going through treatment (a reaction to the bleomycin) and I felt it has taken me until just recently (just over 2 years) to really feel that I am able to run and do other cardio activity as I had before I was sick. I have slowly worked my way up to running and other cardio intensive workouts, but it has taken time. Don’t push yourself too hard, and make your goals realistic, reasonable, and flexible. Your body (and mind) is going through a lot right now, and you will need time to recover. Make sure you give yourself that time. So, in response to your question, “but have you found that you’ve been able to work towards getting to the place you were before cancer?” I have found that I am a different athlete now then I was before my cancer diagnosis. I do not know where I would be in terms of athleticism without that health experience, but I do know that I have worked very hard over the past 2 years to be able to run for 30 minutes straight, or just recently swim for 45 minutes quite easily. Do I still wish I could run faster and farther? Of course, and now, just like everyone else trying to get into better physical shape, I am trying to run a little bit more every day. So, in response to your question, “but have you found that you’ve been able to work towards getting to the place you were before cancer?”, I have found that I am a different athlete now then I was before my cancer diagnosis. I do not know where I would be in terms of athleticism without that health experience, but I do know that I have worked very hard over the past 2 years to be able to run for 30 minutes straight, or just recently swim for 45 minutes quite easily.